Last month I was thrilled to make a trip back to Maine, where I grew up, to visit family. 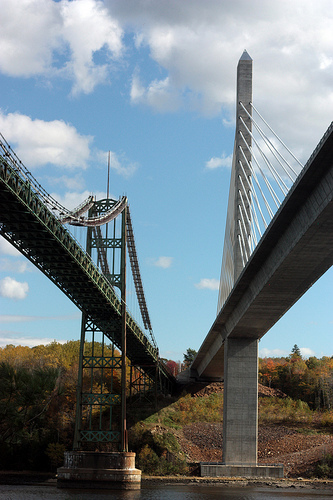 During my visit my father and I played tourists and visited the new Penobscot Narrows Bridge and Observatory. It’s a fascinating structure and one that I would probably love unabashedly, except for the circumstances of its existence. On the left is the Old. 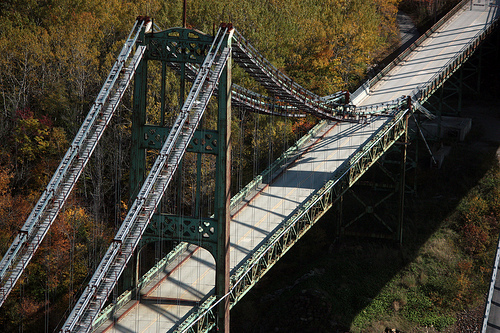 The Waldo-Hancock Bridge, built between 1929-1931. 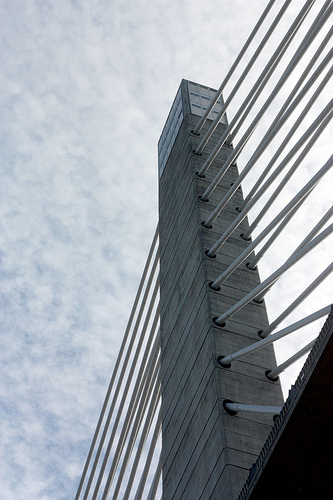 It was one of the first two bridges in the US to use Robinson and Steinman’s prestressed twisted wire stand cables and the first bridge to use Vierendeel trusses in its towers (a later example of a bridge that used this design element is the Golden Gate in San Francisco). For most of my growing-up life, there was an osprey’s nest on the top of the tower on the Verona side of the bridge (seen here). In recent years the bridge was deemed unsafe for the weight of modern traffic. They added to the structure to shore it up temporarily, but ultimately it was decided to push forward to build a new bridge, next to the old one. Now, I like bridges. I like old bridges, I like new bridges, I am fascinated by the engineering work that makes them support (or not) the traffic that goes over them. But, I am highly sadden to see the old bridge go. The state in which it exists now is a much dilapidated shadow of the proud, green bridge we drove over to visit my grandfather, to get to Ellsworth to meet the bus that would take me back and forth to school my final two years of high school, to get to Blue Hill for soccer games or the Blue Hill Fair. And the preservationist and Lover of Old Things in me is devastated at the impending loss of this pioneering example of bridge engineering. I have not yet seen any kind of a plan for the old bridge, although I did search the internet to see if there were plans for a pedestrian bridge, or greenway, or the other kinds of things that old bridges tend to become. Once the paint is gone from a metal surface, the rate at which it corrodes snowballs, and the point where it becomes un-salvageable can happen in not much more than a blink of the eye. This narrative is very moving for me. I find, as I sit here taking a break from the mundane Monday work schedule, that my throat has become constricted and my eyes well up with tears. It is overwhelming for me as I hate the new bridge and can remember my grandmother telling about using a ferry to get across the river here. The trip from Hancock to Waldo County didn’t occur often before that grand bridge was built.